This award will be given to the most effective financial sector Communication team and will be measured on a campaign or one-off project within the financial sector during the year. 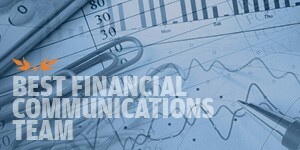 Concentrate on work that is primarily targeted at investors or other financial industry audiences. The team will be asked to show their strategy and how it was implemented, how they measured it and amended if it was needed, also show an ability to be agile within a sometimes turbulent marketplace.